Successfully Added High Power Portable Signal Jammer for GPS, Cell Phone, WiFi to your Shopping Cart. High Power Portable Signal Jammer - a powerful and portable solution for completely blocking nearby cell phones, WiFi, and GPS signals. Usable worldwide. 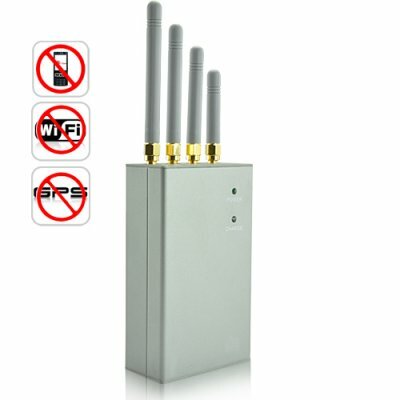 Powerful and effective, this portable signal jammer effectively disables any WiFi networks, GPS devices, and cell phone signals (on the GSM, CDMA, DCS and PHS bands) without interrupting any other electronic devices. The highly portable size and one-touch power button allows users to quickly turn the device on or off for instant jamming and unjamming. Incredibly easy to operate and carry around, this portable signal jammer is both the ideal security and anti-security device and quite simply one of the best we have ever tested. With this HIGH POWER Portable Signal Jammer, you get a TRUE working radius of up to 20 meters. So how does it work? Just turn it on when conducting your company presentation, meeting, worship service, legal proceedings, or other important activities, and you will instantly have complete security and a disturbance-free environment. This high powered portable signal jammer is in stock in our warehouse right now for single piece or large bulk purchases. Order yours today and we'll express ship it out tomorrow - guaranteed! Brought to you by the leader in China Wholesale Electronics - Chinavasion. Important Note: This Product may not be permissible to import into certain countries. You are solely responsible for finding out whether this product is legal to import and/or use in your country. We will send you the product you order, however we will not accept any liability for customs issues arising from the ordering or usage of this device.. Important Note: This Product may not be permissible to import into certain countries. You are solely responsible for finding out whether this product is legal to import and/or use in your country. We will send you the product you order, however we will not accept any liability for customs issues arising from the ordering or usage of this device. Is the signal blocking on this signal jammer only towards a specific direction (directional jamming)? No, the 4 omni-directional antennas will spread out in a circle and block everything in its radius.